Often referred to as "The Gorge," the Columbia River Gorge is an extraordinarily scenic region rich in recreation opportunities. Because of its favorable wind conditions, it has become an international hotspot for windsurfing and kite sailing. The unique beauty of the Gorge, shaped by the Ice Age Floods, is preserved by local, state, and US agencies as parks and public lands and has been officially designated as the Columbia Gorge National Recreation Area. 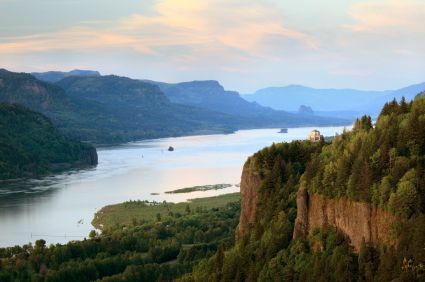 Roughly 80 miles in length, the Gorge transitions from a temperate rainforest ecosystem at the west to dry pine forests and prairies at the east. Gorgeous waterfalls and striking basalt rock formations can be found on both sides of the river. While there are several gorges along the 1,243-mile-long Columbia River, THE Columbia River Gorge is located at the point where the river cuts through the Cascade Mountain Range. Forming part of the border between Oregon and Washington State, the Gorge runs approximately from the city of Troutdale to The Dalles (west to east). Whether you plan to visit for a weekend or an extended vacation, you won't run out of great attractions and activities during your Columbia Gorge visit. You'll find a range of visitor services and accommodations in the parks and communities that line the Gorge. There are upscale resorts, boutique hotels, no-frills motels, historic lodges, and campgrounds and RV parks. If you are traveling by air you will want to fly into Portland International Airport. Interstate 84 is the major freeway that parallels the Columbia River. It runs along the Oregon side from Portland through the Gorge communities of Troutdale, Hood River, and The Dalles. On the Washington side of the river, State Highway 14 is the primary route. There are only 3 bridges that cross the river within the Gorge. Conditions vary with each season, with winter being the only time to avoid the Gorge. Spring charges up the waterfalls and brings wildflowers. Trail conditions can be wet and muddy, however, so use caution. Summer and Fall are awesome seasons for your visit, bring sunny dry weather and excellent conditions for land and water recreation. The fall foliage along the Columbia River Gorge is stunning.